Dispersed Ag nanoparticles were prepared in aqueous solutions in the presence of pure poly[2-(dimethylamino)ethyl methacrylate] (poly-DMAEMA), poly[2-deoxy-2-methacrylamido-d-glucose] (poly-MAG), and their copolymers of poly[MAG–DMAEMA] with different mole fractions. Polymers contributed to the silver reduction, formation of nanoparticles, and stabilization of suspensions. No agglomerations of nanoparticles are formed. For each sample, more than one thousand silver particles were measured by transmission and scanning transmission electron microscopy to determine their number vs diameter and volume versus diameter distributions. The samples with the smallest nanoparticle mode diameter of 2.3 nm were formed in DMAEMA homopolymer suspension, while the mode diameter increased up to 13.3 nm in copolymers depending on the mole fraction of DMAEMA. A model of Ag nanoparticles’ growth taking into account the structure of the copolymers and the amount of reducing centers per monomer is proposed. 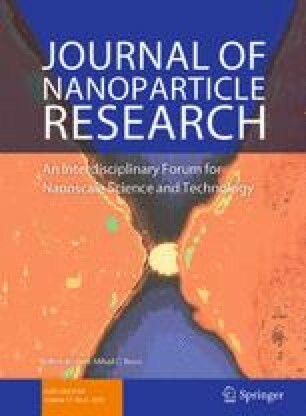 The volume fraction of large Ag particles (>15–20 nm) in the tail of distributions was determined to estimate the part of less efficient nanoparticles assuming that only surface atoms are active. The largest volume occupied by big particles is measured in the solution with pure poly-MAG. Figures of merit, as the ratio of particle area to total volume of particles, were compared for five systems of Ag NPs/polymer. They can be understood from an economical point of view as the total silver investment compared to efficiency. The online version of this article (doi: 10.1007/s11051-015-3083-5) contains supplementary material, which is available to authorized users. The authors are deeply indebted to Prof. Cécile Hebert for kindly providing access to the microscopes and interpretation software of the Centre Interdisciplinaire de Microscopie Electronique of EPFL and the academician Prof. E. F. Panarin for the fruitful discussions.